The past few weeks, I've been mulling over the future of "the book". In particular, the textbook and even more precisely the ELT textbook. Probably been thinking about this because I'm busy every day making books (and I use "make" deliberately - authors these days can "make" books and not just write them). Further prompted by the recent announcement that Korean public schools will be "bookless" by 2015. Also because I've always been puzzled by the force of the written word as "a book". Particularly, in English language teaching where words are free and language doesn't of necessity have to come wrapped and bounded in a book. What is the future? What are some possible outcomes for the now tiring "textbook"? 5. Remixing. Online materials are woven together into a complete "set". Many teachers are experimenting with this but it is the most problematic due to the stranglehold that copyright law has on education (and I'm one who ardently thinks education should get a pass on this). I've been busy experimenting in a very rudimentary way. This coursebook would be a good example. Or look at how I made a book of my blog. I'm also making courses without books. Teach | Learn, my own textbook is also a small attempt to open things up and give both teachers and learners more options within the space of the book. But these are very small steps. 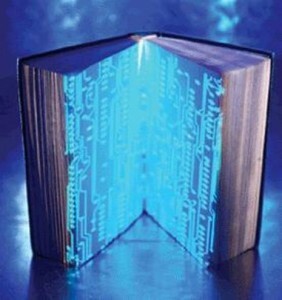 The book will always be here with us but the form will change dramatically. My own sniffer tells me that ebooks WON'T be the future and they are the cassette tapes of the present generation. Instead, we'll have very book looking devices with electronic paper. That's my guess. What's your view of the future of the textbook?